Modular Driven Technologies is proud to announce their attendance of the 2019 NRA Annual Meeting in Indianapolis. The company will be displaying Chassis systems, magazines and accessories including the MDT ACC, LSS Gen2, LSS-XL Gen2 , ESS, and TAC21. Hoppe’s is proud to have been named the Official Gun Cleaning Product of the United States Practical Shooting Association. Hoppe’s, a Vista Outdoor brand, serves shooters of all disciplines. Guidefitter announced that it has launched the outdoor industry’s first influencer marketing solution compatible with federal firearms license requirements. The company also announced that it has added Wyoming-based Weatherby to its growing list of outdoor gear partners and Guidefitter’s first firearms brand partner. Tula Cartridge Works has established a new wholesale distribution infrastructure to serve North America through USARM NORD LLC. RCBS is proud to have been named the Official Reloading Sponsor of the Precision Rifle Series. PRS matches involve the practical application of long-range rifle shooting born out of military, law-enforcement and hunting scenarios. Guest Shot:Â "It's not a miss, it's an unacceptableÂ hit"
Image from KR Training, with permission. You’re at the gun range practicing. After shooting, you look at your target and examine your holes. Inevitably there are some holes in places you didn’t want them. If you are like I was, you call them “misses”, note them, maybe a little disappointed, but you chalk them up and move on. The gravity of those holes isn’t great. 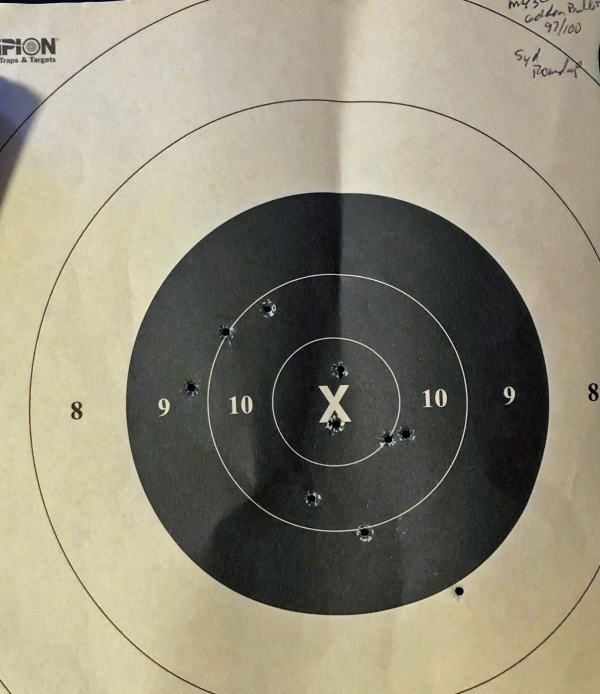 This target depicts results of the "Five-Yard Round-Up" (h/t, Justin Dyal) using the S&W Model 43C and Remington Golden Bullet ammo. "Acceptable hits" may be just those in the "X" or 10-rings, or just "inside the black." Or it could be scored -- a reason timed standards are relevant. Every bullet that flies will hit something. What is acceptable is a very narrow band. What is unacceptable is quite wide. The implication is in practice, you must work (hard) to get acceptable hits and nothing else. If that means you must slow down, slow down. If that means you need to improve your sight picture, improve it. If you need more training, get more training. Don’t let your practice sessions be nothing but ballistic masturbation — have purpose. 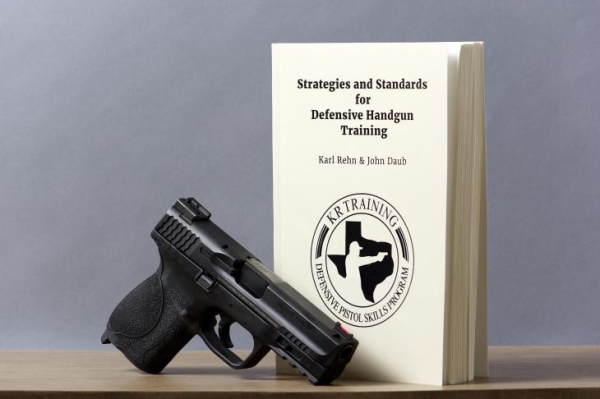 John Daub is senior assistant instructor for KR Training. His credentials include more than 700 hours of training in firearms, empty hand martial arts and combatives, medical, tactics and other self-defense topics. Karl Rehn is the lead instructor & owner of KR Training. His credentials include more than 2500 hours of coursework from more than 60 different trainers over the past 30 years.